Northern Alentejo is a region of rich history, unique artistry and remarkable natural resources. This morning, you will collect your rental car and depart from Lisbon, driving south through the Portuguese countryside to the peaceful region of Alentejo (Drive time 1.5 hours). Your first stop is the small town of Arraiolos, long famous for its hand-embroidered wool carpets and tapestries (Tapetes de Arraiolos). These carpets, sewn in wool on a canvas frame, were initially inspired by Persian rugs, but have developed a unique regional style through several centuries. For generations embroiderers here have crafted the Tapetes de Arraiolos found in palaces and manor houses throughout Portugal. This morning you will visit a local rug factory on your own. Continue on to Évora, an ancient city with well-preserved ruins that speak of the rich history of the city’s inhabitants through the Roman, medieval and Renaissance periods to the present. We recommend a stop at Pousada dos Loios, where you can enjoy lunch, featuring local specialties, in the beautiful setting of a restored convent. You will meet your guide after lunch, setting out together for a private half-day tour of the city. Évora’s historical city center has been recognized as a UNESCO World Heritage site and is home to a Roman Temple believed to date from the first century A.D., which is unique in Portugal and serves as the city’s landmark. Later, drive to Herdade da Cortesia, a new four-star hotel in the town of Avis, on the banks of the Maranhão Dam. This 47-hectare estate is located in the heart of Portugal’s picturesque North Alentejo region. You will have time to settle in before dinner on your own. Dine in the hotel’s restaurant, where regional cuisine is prepared with a modern touch, or venture out. We will provide you with additional restaurant suggestions. Following breakfast at your hotel your morning is at leisure. Relax by the hotel’s outdoor pool, or choose from several optional activities including: a cycling tour (guided or on your own), horse-riding, wine tasting, or a picnic. 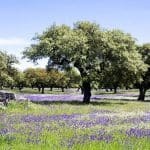 The local landscape is fertile ground for oak, olive, pine and eucalyptus trees, as well as vineyards, orchards and bright gardens. Birds, including 12 species of raptor, amphibians, reptiles and several species of mammals make their home here. Among them, dusky wild boar, with their unique striped piglets. This afternoon, visit the nearby towns of Estremoz and Vila Viçosa on your own. These are marble towns, notable for the abundance of this valuable stone in shades and streaks of white, cream, pink, grey and black. 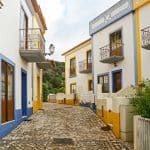 Estremoz boasts streets made of marble cobble stones. The pink shades of marble, Rosa Aurora and Estremoz Pink, in particular, are the most highly sought after. 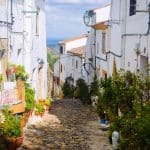 This afternoon visit the hilltop town of Monsaraz, with its medieval walls and narrow streets overlooking beautiful Lake Alqueva. Your visit includes a winery visit and tasting. An optional luncheon can be arranged upon request. Enjoy your final breakfast in Avis this morning. You will have time to explore more of the region at your leisure today. Return to Lisbon, where your car can be returned any time before 8:00 pm, or continue on to your next Willing Foot destination.